The Palawan Princess - The second largest non-nacreous baroque pearl discovered from the giant clam, Tridacna gigas. The "Palawan Princess" weighing 5 pounds (2.27 kg or 11,340 carats) is the second largest non-nacreous baroque pearl discovered from the giant clam Tridacna gigas, off the coast of the Island of Palawan, in the Philippines, a natural habitat of the giant clam. The largest ever non-nacreous baroque pearl discovered from the giant clam, weighing 14.1 pounds (6.395 kg or 31,978 carats) was also discovered from the same habitat off the coast of Palawan, in 1934, and is popularly known as the "Pearl of Allah" based on Wilburn Cobb's legend of the "Pearl of Allah" published in the magazine "Natural History" of New York's American Museum of Natural History, in November 1939, which is now believed to be a fabrication. According to this legend the "Pearl of Allah" was discovered by a Muslim diver off the coast of Palawan, whose hands were trapped when the valves of the clam snapped shut, and thus met with his untimely death, a story that is scientifically untenable. The pearl was presented to the chief of the native Dayaks, who is said to have named it the "Pearl of Allah" because human-like features on the pearl was believed to be a miraculous representation of the Prophet Muhammad, the messenger of Allah. Doubts, have been cast by historians about the truth of this story, as most of the inhabitants of Palawan at the time the pearl was discovered, were Christians, who were evangelized by the Spanish missionaries in the 19th-century. The Dayak Chief gave the so-called "Pearl of Allah" to Wilburn Cobb, as an appreciation for saving his son's life, who had contracted Malaria, something he would not have done if the pearl had any religious significance associated with it. Thus the name "Pearl of Allah" is purely derived from the unsubstantiated story appearing in the "Natural History" magazine of November 1939. It is not known how the name "Palawan Princess" originated. The pearl is said to have been discovered by a professional diver, who did not meet with an unfortunate accident as the ill-fated diver who discovered the "Pearl of Allah" did. The pearl has a striking resemblance to the Cerebrum of the human brain. Even certain regions of the "Pearl of Allah" has such similarities. The "Palawan Princess" has no human features like the "Pearl of Allah." Hence the name "Palawan Princess" cannot be attributed to any human features on the pearl, like the "Pearl of Allah." The name undoubtedly reflects the place of origin of the pearl, Palawan Islands in the Philippines, which has also earned the unique distinction of being the location where the largest pearl in the world, the "Pearl of Allah" was discovered. Thus the Palawan Islands have now earned the double-distinction of being the location where not only the largest pearl in the world was discovered, but also the second largest pearl, the "Palawan Princess." The largest pearl, the "Pearl of Allah" is undoubtedly the "King" or "Prince" of all pearls. In this sense the name "Palawan Princess" is quite appropriate for the second largest pearl, also discovered from the same region. 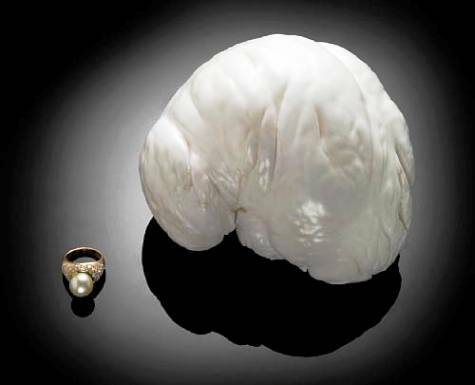 The "Palawan Princess" which has an uncanny resemblance to the human brain, is a non-nacreous blister pearl having an approximate diameter of 6 inches (15.2 cm). In comparison the "Pearl of Allah" has a length of 9.5 inches (24 cm). The "Palawan Princess" which has been put up for sale, by international auctioneers Bonhams & Butterfields at their Natural History Auction, on Sunday, December 6, 2009, under Lot No. :- 2377, is accompanied by the lower valve of the original giant clam shell in which the pearl was discovered, showing the point-of-attachment where this blister pearl developed. This valve measures 19 by 13 by 6.5 inches (48 cm by 33 cm by 16.5 cm). The size of the shell is small in comparison to some giant clams that measure 1.2 meters (120 cm) across, and weigh as much as 200 kg. Scientists believe that the smaller size of the clam is associated with the large blister pearl growing inside the clam, showing that the clam used most of its energy for the growth of the blister pearl, rather than the growth of its shell. The weight of the pearl is 5 pounds which is equivalent to 2.27 kg or 11,340 carats. The color of the pearl is white, the color of the microcrystalline calcite fibers that form the nacre-like substance of the pearl. Being non-nacreous the pearl does not have the luster and brilliance of nacreous pearls, but instead the matte-like appearance of porcelain, commonly referred to as porcellaneous. The surface of the pearl has markings similar to the gyrations or fissures of the human brain. The pearl was examined and authenticated by gemologists of the European Gem Laboratories, USA, in New York, whose director Mitch Jacubovich said, "This is an once-in-a-lifetime look at one of nature's most unique treasures. A pearl this size is not only one of the largest ones we have ever seen, it is among the largest pearl ever seen anywhere." Another gemologist and senior appraiser of the Universal Gemological Services called the pearl, "clearly one of the most valuable pearls of its kind in the world today." The "Palawan Princess" is a non-nacreous pearl, produced by the giant clam, Tridacna gigas. From a biological point of view, the "Palawan Princess" is considered a kind of pearl, being the natural product of a shelled mollusk, the giant clam. However, from a gemological point of view, the "Palawan Princess is said to be a non-nacreous pearl, also known as a calcareous concretion, lacking the luster and iridescence of "true pearls." The differences between nacreous and non-nacreous pearls are outlined in the table below. 2 Pearl formation is a defensive response to an irritant, which is covered by layers of nacre. Pearl formation is a defensive response to an irritant, which is covered by a nacre-like substance. 3 Pearls have an attractive luster and iridescence caused by nacre. Pearls have a matte-like luster of porcelain and are known as porcellaneous. They lack the luster and iridescence of nacreous pearls. 4 Nacreous pearls are known as "true pearls" Non-nacreous pearls are known as calcareous concretions. 5 Nacre is made up of conchiolin and the crystalline form of calcium carbonate known as aragonite. The nacre-like substance is made up of conchiolin and the crystalline form of calcium carbonate known as calcite. 6 Aragonite is laid down as tiny hexagonal platelets, with a width of 10-20Âµm and thickness of 0.5Âµm. Calcite is laid down as fibers or needles, forming bundles of microcrystalline fibers. 7 The thickness of the aragonite platelets is comparable to the wavelength of light, and causes the scattering of light known as iridescence. The bundles of microcrystalline fibers do not cause the scattering of light. Hence the lack of iridescence in non-nacreous pearls. 8 No chatoyant effect like a "flame structure" seen in true pearls. In some non-nacreous pearls such as conch pearls and quahog pearls, the calcite microcrystalline fibers, cause a type of chatoyancy, a flame-like shimmering effect, known as the "flame structure" which is sometimes spectacular, that some gemologists think that conch pearls should be re-classified as "true pearls." The natural habitat of Tridacna gigas are the shallow coral reefs of the South Pacific and the Indian Oceans. Two of the common habitats of the giant clam, are the Great Barrier Reef off the coast of Queensland in northeast Australia, the largest coral reef system in the world, and the coral reefs off the Philippine Islands. Little wonder then, that two of the largest giant clam pearls were discovered from the same habitat, off the coast of Palawan Islands. In keeping with their large size, which can sometimes reach as much as 1.4 meters and a weight of 250 kg, giant clams can produce pearls of enormous sizes. However, the occurrence of such pearls is extremely rare. An indication of its rarity can be obtained, just by considering the year of discovery of the two largest recorded giant clam pearls, the "Pearl of Allah" and the "Palawan Princess." While the "Pearl of Allah" was discovered in 1934, the "Palawan Princess" was discovered recently (exact year not known). Assuming that the "Palawan Princess" was discovered in the year 2000, it has taken 66 years for the second largest giant clam pearl to make its appearance, after the discovery of the largest giant clam pearl in 1934. This gives an indication as to the extent of its rarity, which greatly enhances the value of the pearl. Hence the comment by Mitch Jacubovich, that it was a once-in-a-lifetime opportunity to look at one of nature's most unique treasures. How long would it have taken for the "Palawan Princess" to develop inside the giant clam ? If the growth rates of giant clam pearls are known we can make an estimate as to how long it would have taken for the pearl to develop inside the clam. But, unfortunately, growth rates of giant clam pearls are not known, even though the growth rate of the giant clams themselves in captivity are well known. The growth rate of giant clams has been estimated at 2 inches (5 cm) per year in young individuals. Growth rate slows down in older clams. Their life span is quite long but uncertain. Estimates of the life span vary from 50 to 100 years. The rate of deposition of nacre in oysters and mussels, producing nacreous pearls is very slow, and in most species it's about 0.6 mm per year. If we apply this rate to the "Palawan Princess" having a diameter of 6 ins (15.2 cm); assuming that the pearl is spherical and the growth is even right round the pearl, centered around a point in the middle; the time taken for 7.6 cm of nacre to be deposited at the rate of 0.3 mm would be 76/0.3 = 253 years. This is much above the average life span of a giant clam, which is 50-100 years. If the rate of deposition is double that of nacreous pearls - 1.2 mm per year - the time taken would be 76/0.6 = 126 years, which is still higher than the average life span of giant clams. If the rate of deposition is three times that of nacreous pearls - 1.8 mm per year - the time taken would be 76/0.9 = 84 years, which falls within the average life span of 50-100 years for giant clams. Thus a deposition rate of 1.5-3.0 mm per year would give an average life span of 50-100 years. Thus assuming that the "Palawan Princess" was formed in a giant clam with an average life span, at the growth rate of 1.5-3.0 mm per year, the pearl would have taken somewhere between 50 to 100 years to develop. 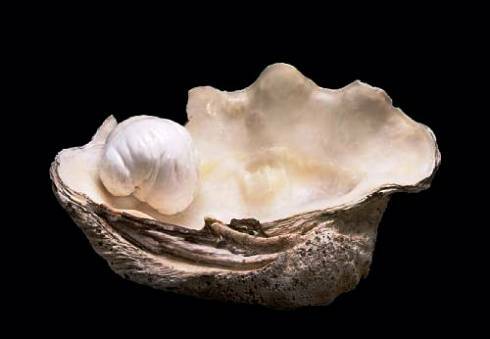 But, given the fact that the size of the clam shell is smaller (48 by 33 by 16 cm), believed to be associated with the growing pearl inside the shell, the energy of the living clam being expended more for the growth of the pearl than the shell, the estimation of the time taken for the development of the pearl would necessarily be more complicated, and much less than 50-100 years. The same nacre deposition rate applied to the "Pearl of Allah" gives a period of approximately 80 years as the time taken for its formation. The above calculations it must be noted however, are based on several assumptions, and may not reflect an accurate picture of pearl formation in giant clams under natural conditions. Non-nacreous pearls have relatively less commercial value than nacreous pearls, despite the fact that some non-nacreous pearls like quahog pearls and conch pearls, with their "flame structure" and stunning beauty even surpasses the beauty of most low-grade nacreous pearls. The value of non-nacreous pearls seem to be unfairly tied down to the definition of "true pearls." This is one reason that has prompted gemologists like Kenneth Scarrat, the director of GIA in Bangkok to suggest that some non-nacreous pearls, like conch pearls, be elevated to the status of "true pearls." The extremely rare and beautiful purple quahog pearls seem to suffer from the same fate as conch pearls. The value of calcareous concretions like the "Pearl of Allah" and the "Palawan Princess"
2) Their enormous sizes, going on record as the first and second largest natural pearls produced by a bivalve mollusk. 3) The long time taken for the pearls to develop, which may be as long as their mature life time. 5) The collectors value associated with such extremely rare creations of nature, both for private collectors and well-established museums. The world's second largest pearl, the "Palawan Princess" is due to come up for sale on Sunday, December 6, 2009, at the annual holiday auction of Natural History, organized by the renowned international auctioneers Bonhams & Butterfields. The pearl has been listed in the auction catalogue under Lot No. 2377 and is referred to as a - Rare and Immense Natural Non-Nacreous Pearl - "The Palawan Princess." A pre-sale estimate of $300,000 to $400,000 has been placed on the pearl, which is in keeping with previous prices obtained for such pearls. However, depending on factors laid out above, such as the extreme rarity of the pearl, its enormous size, its natural provenance, and above all the collectors value associated with the pearl, it would not be surprising if the successful bid exceeds the pre-sale estimate. The annual holiday auction also features a variety of distinctive and high-quality mineral specimens, exceptional fossils, gold nuggets, and unusual jewelry, including a selection of high-quality gems and lapidary works of art.